Arching sprays of golden, fern-like foliage make 'Fernspray Gold' an arresting specimen for the landscape. Each unique, flattened branch tapers to a point just like a fern frond. It needs some sun to develop the best colour but avoid very exposed hot sites. 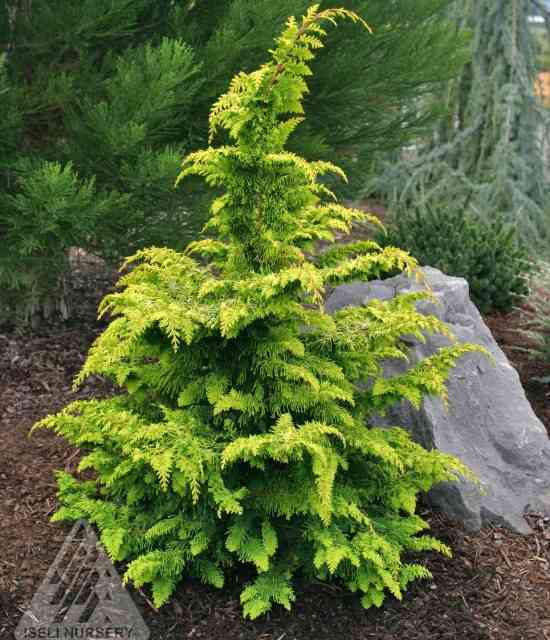 'Fernspray Gold' prefers average to moist well drained soil in a sheltered location. It is on the edge of hardiness in our area so will benefit from a winter wrap in a site that is not well sheltered. It can be shaped if desired when it is young to promote a more uniform symmetrical shape.